We have reviewed several Rust-Oluem products on the best expoy garage floor post, and they never seem to disappoint us. Rust-Oluem is a brand that has been around longer than almost all the other competitors on the market. During their many decades, they have gained experience and knowledge that allows them to create premium products, without the premium price tag. Living up to the reputation of Rust-Oluem is never going to be an easy task. 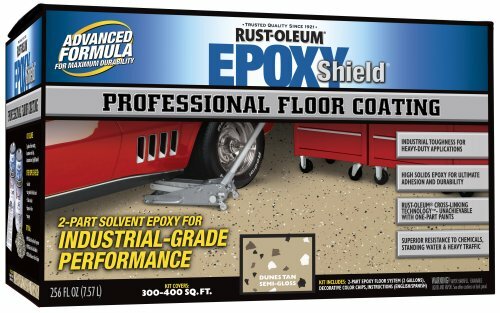 Today in our Rustoleum EpoxyShield review we will find out if this subtle, beautiful, and durable product is worthy of the Rust-Oluem name. This kit is called “Dunes Tan”, and we think that it’s a great way to describe the final color of this product when it has cured properly. If you close your eyes and imagine the beautiful golden sand dunes in the Sahara desert, that’s what the base color of this epoxy looks like. It’s a stunning color blend that creates an impeccable semi gloss finish when applied. Like most Rust-Oluem products, the most interesting part is the metallic flakes. In many of their other products the metallic flakes are designed to be showstoppers that demand attention, but in this product that is not the case. 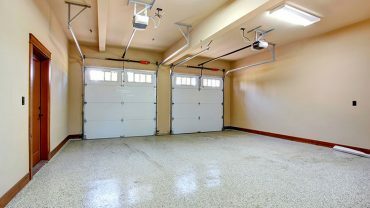 As you probably already know, a garage floor needs to be more than just pretty. It needs to be able to withstand the stresses of garage life. Luckily this product looks great and pulls its weight at the same time. Rust-Oluem actually market this product to professionals as well as to homeowners. They state that this product has “industrial grade performance” which should tell you a little bit about just how tough this stuff is. It’s highly resistant to peeling, scratching, and cracking (which are common issues with some other epoxy flooring). Additionally, it’s able to withstand oil, gasoline, and any other common chemical spills that can occur in a garage. Full instructions are provided within the box. We love the way Rust-Oluem also include a link to an instructional video online. It’s much easier to get an idea of how to lay the epoxy if you watch it being done first hand (instead of reading about it). The kit includes everything you need to get your floor coated and it can cover up to 400 SqFt (more than enough for a 2 car garage). It’s fast drying too as it is ready to walk on after 1 day (and you can drive on it after 3 days). As you might have already guessed, we absolutely love this product. It’s easy to see why from our review above. The durability is off the charts for an epoxy of this kind. It’s a product that is going to give you years of hassle free reliable flooring. The stunning tan color combined with the tonal metallic flakes make it a great choice for people who want an interesting garage floor (but want to keep things a little classy and not too outlandish). When you combine this with the excellent price point and the super easy application (thanks to the instructional videos) it’s a highly competitive product. In our opinion, this is definitely an epoxy to add to your shortlist and is more than worthy of your consideration.